Hippo signaling has been recognized as a key tumor suppressor pathway. Here, we perform a comprehensive molecular characterization of 19 Hippo core genes in 9,125 tumor samples across 33 cancer types using multidimensional "omic" data from The Cancer Genome Atlas. We identify somatic drivers among Hippo genes and the related microRNA (miRNA) regulators, and using functional genomic approaches, we experimentally characterize YAP and TAZ mutation effects and miR-590 and miR-200a regulation for TAZ. 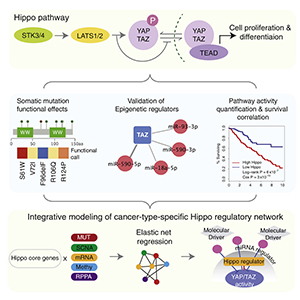 Hippo pathway activity is best characterized by a YAP/TAZ transcriptional target signature of 22 genes, which shows robust prognostic power across cancer types. Our elastic-net integrated modeling further reveals cancer-type-specific pathway regulators and associated cancer drivers. Our results highlight the importance of Hippo signaling in squamous cell cancers, characterized by frequent amplification of YAP/TAZ, high expression heterogeneity, and significant prognostic patterns. This study represents a systems-biology approach to characterizing key cancer signaling pathways in the post-genomic era.